« 12 Days of Anime #11: Toki yo Tamare! I watched Kamichu! for the first time this year. It’s about Yurie, a middle school girl who accidentally becomes a god, and all the shenanigans she gets into with the spiritual side of the world and the day-to-day struggles of being a young, shy teenager. It was charming enough, but flip-flopped between sitcom and iyashikei so ended up a bit boring in some respects. 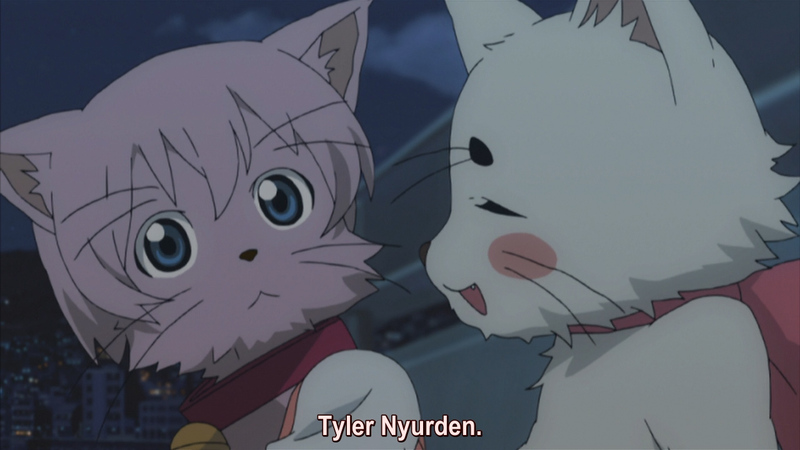 There was an episode where Yurie gets turned into a cat. She stumbles upon a gang of cats. The leader is called Tyler Nyurden. Kamichu! had a goddamn Fight Club parody with cats.